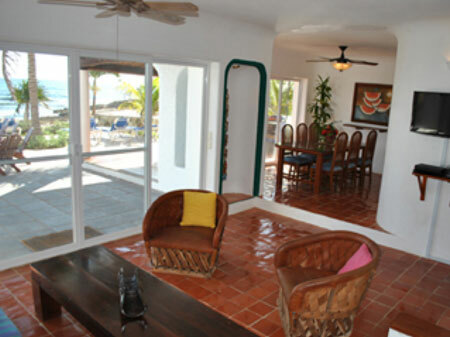 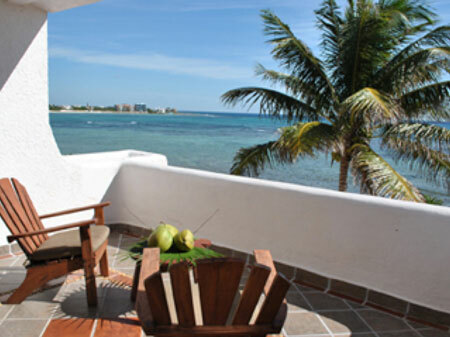 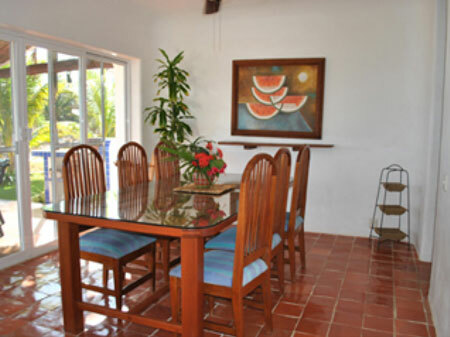 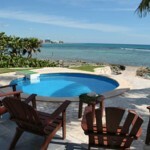 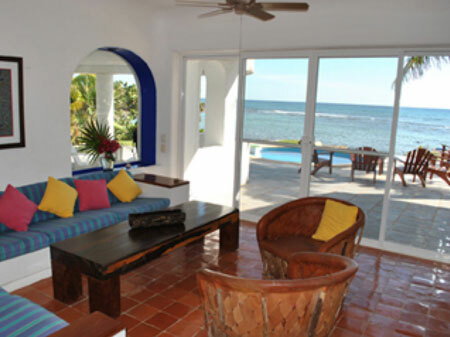 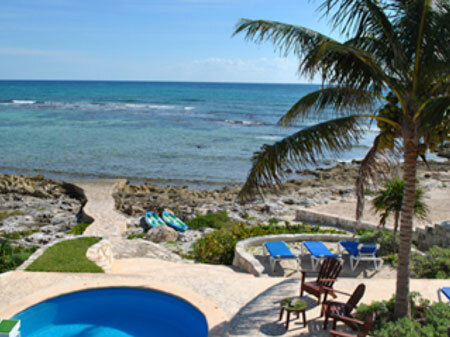 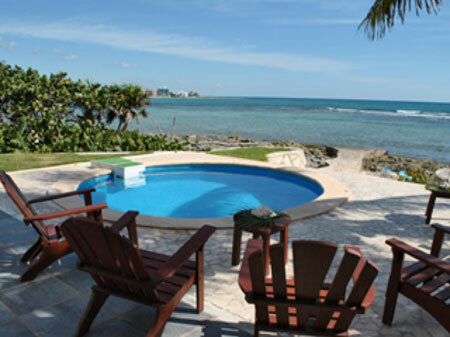 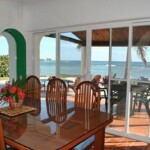 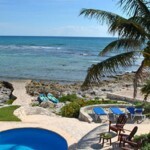 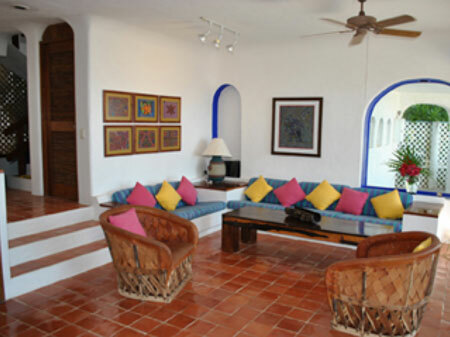 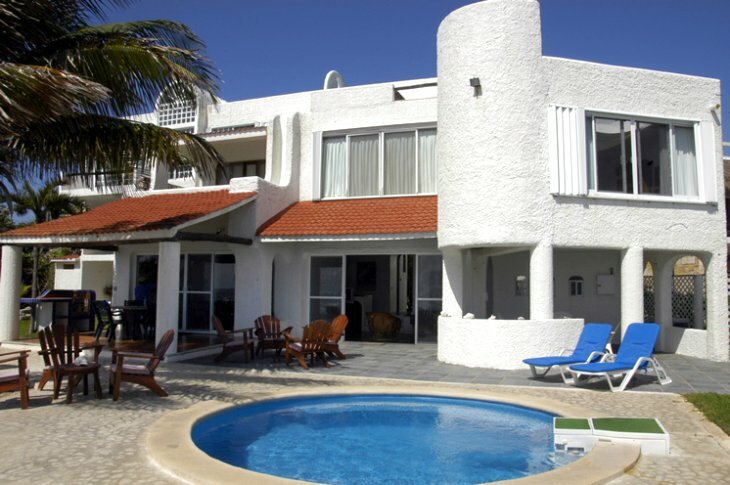 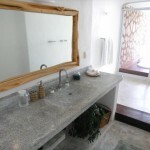 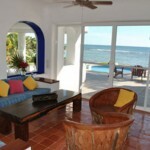 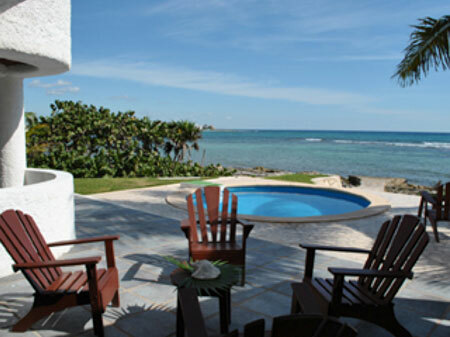 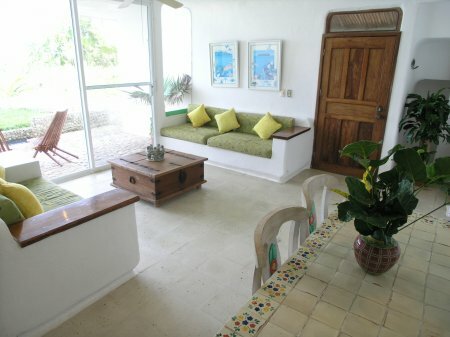 Casa Balam Ek is a delightful vacation home with a wealth of character, greeting guests with casual comfort after a day at the beach, touring the ruins, snorkeling or Scuba diving. 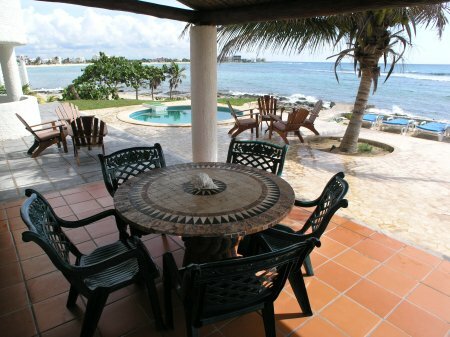 The large pool deck surrounding the oceanfront swimming pool has plenty of room for sunbathing, relaxing with a great book or chatting over cocktails in the shaded terrace area. 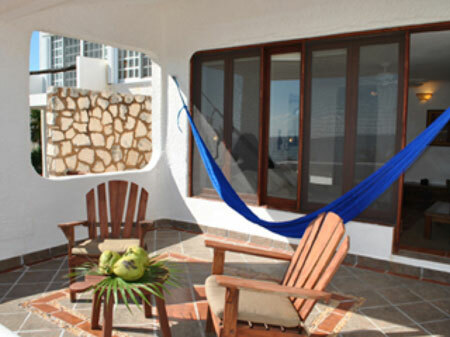 The décor is warm and inviting and the location offers gorgeous views of the Caribbean and all of Half Moon Bay, as seen from its south rim. 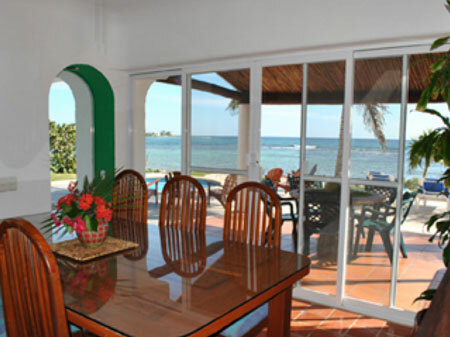 The first floor of Balam Ek has a sunken living room with double glass sliders, framing the amazing scenery just outside the room. 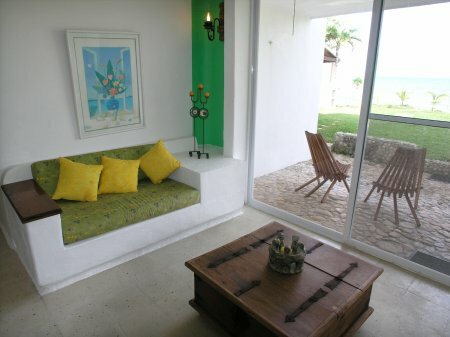 An embedded corner couch is perfectly positioned for enjoying the views outside or relaxing and watching a movie on TV . 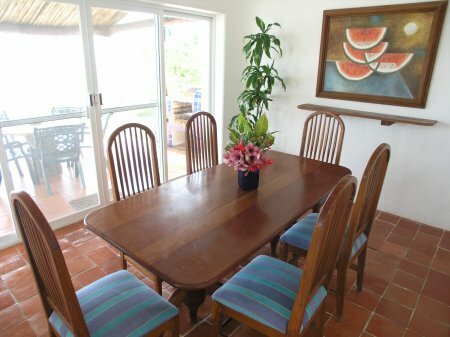 Adjacent to, and one step up from the living room, takes you into the dining room, where another set of double glass sliders, opens to a covered outdoor patio with built-in grilling area. 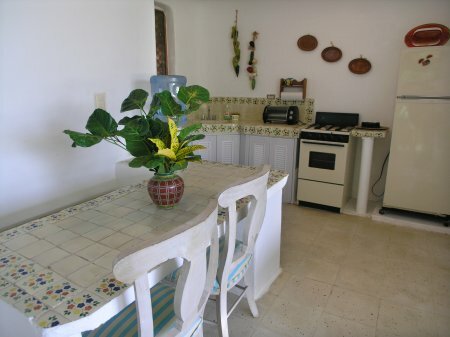 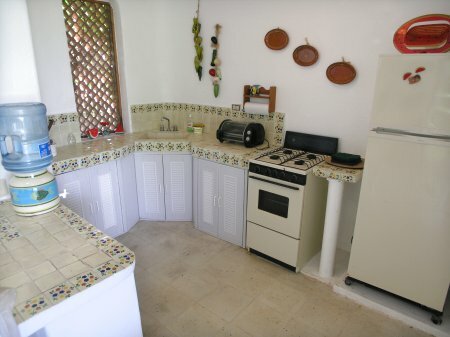 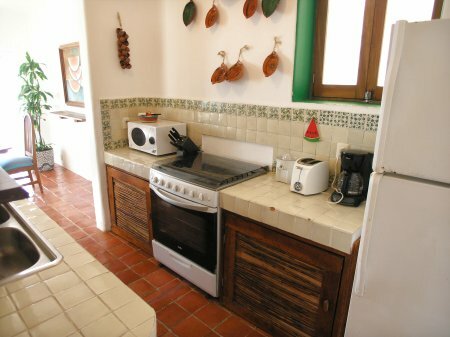 The kitchen is just around the corner from the dining room and is well equipped for cooking your own meals, however, since ‘you are on vacation’, maybe you would prefer to use the cook services that are available. 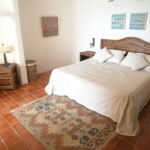 There are three air-conditioned bedrooms in the main house. 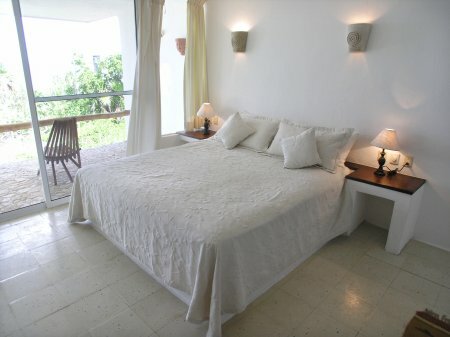 The master bedroom is on the second floor and has a king size bed, seaside balcony, private bath, and an attached half-bedroom with a single bed. 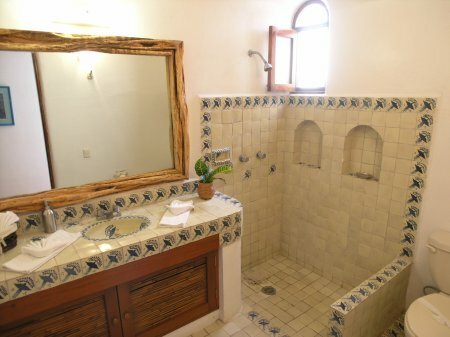 This is a wonderful arrangement for parents with a small child. 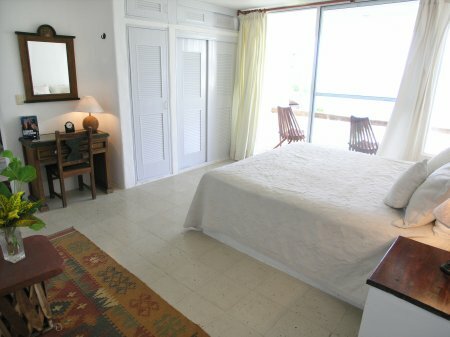 The guest bedroom upstairs has a private bath and is furnished with two double beds and a single bed and has a wide window view of the sea. 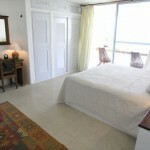 The downstairs guest bedroom has a king size bed with a private, seaside patio. 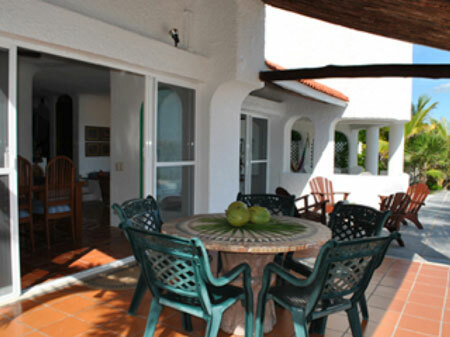 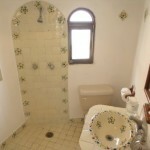 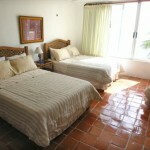 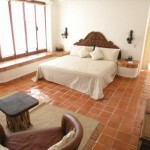 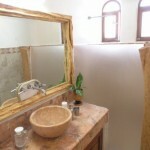 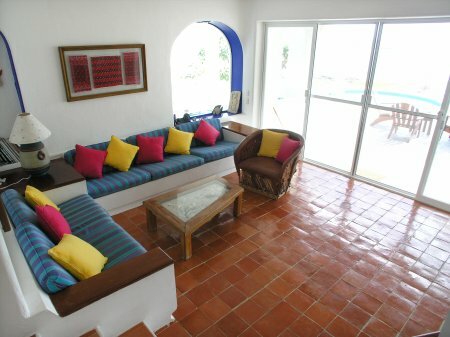 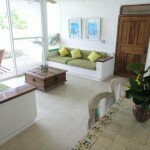 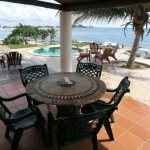 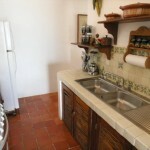 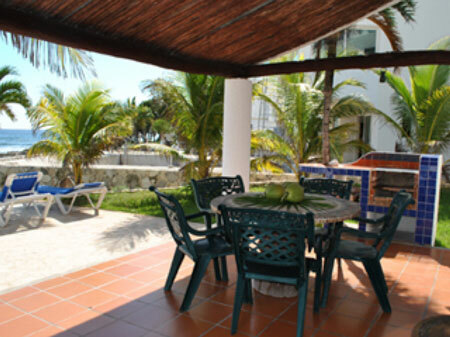 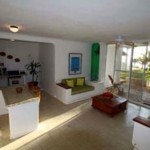 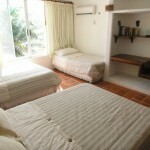 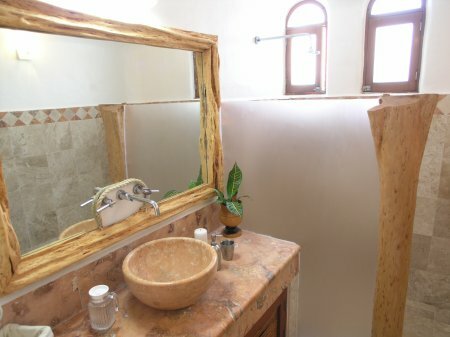 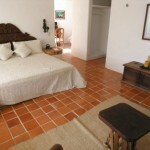 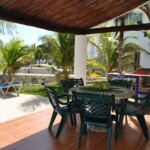 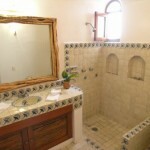 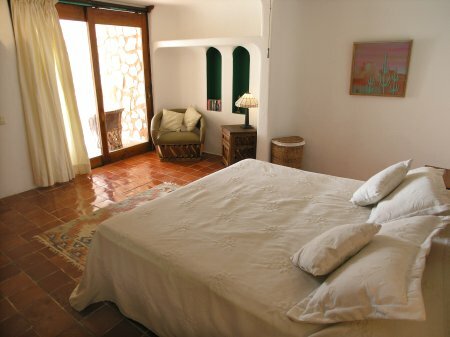 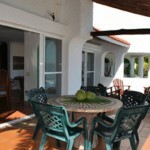 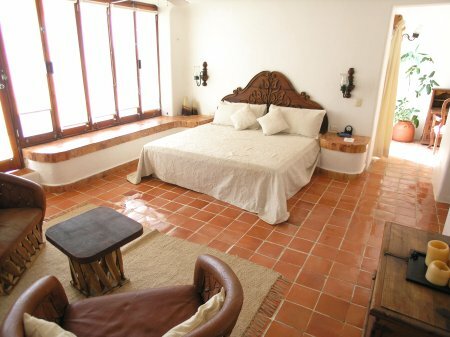 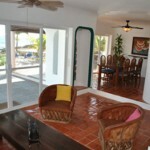 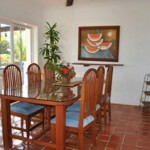 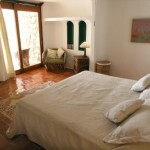 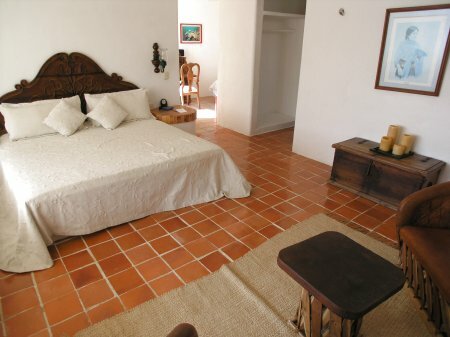 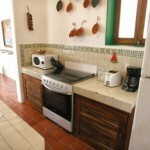 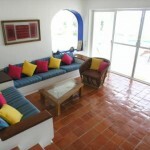 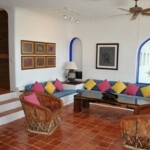 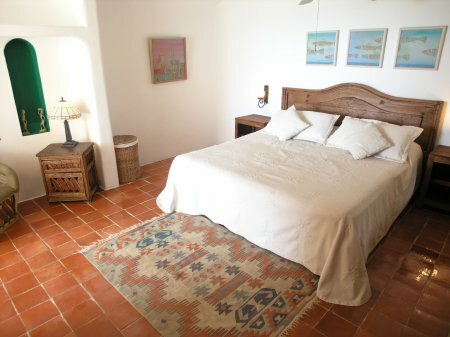 Balam Ek also has a beautifully decorated, two-story studio apartment. 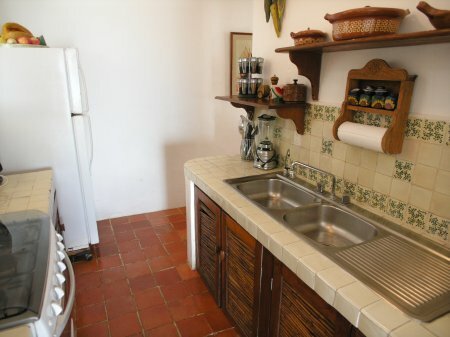 Though it adjoins the main house, it has a separate, private entry; perfect for couples or teens needing a little added privacy. 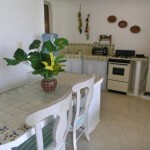 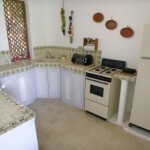 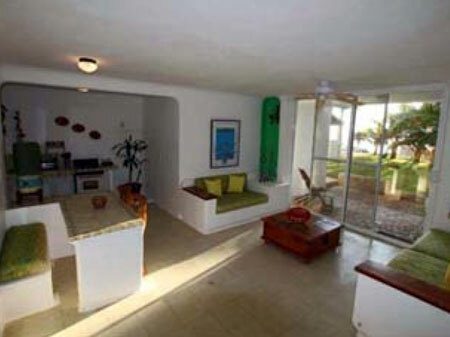 The living/dining area downstairs has a seaside patio, as well as a fully equipped kitchen including a stove, refrigerator, and all the utensils. 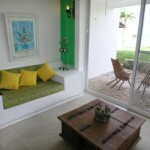 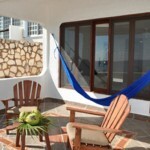 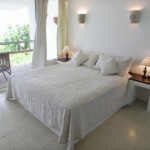 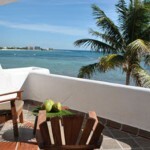 On the upper level, the bedroom has a king bed and private seaside terrace for enjoying the views and the sea breeze. 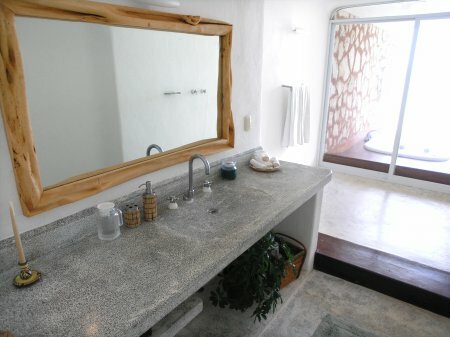 The spacious bathroom has a massive open shower with a glass slider inviting guests ‘outdoors’ for a luxurious soak in the Jacuzzi tub; this can be enjoyed night or day! 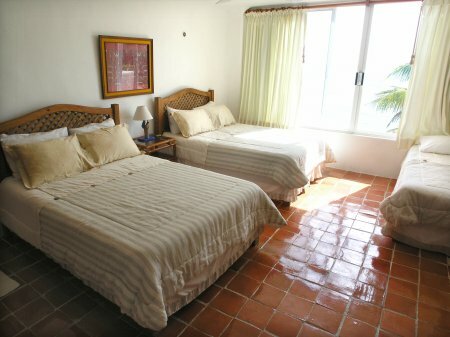 Maximum occupancy Main House: 8 people. 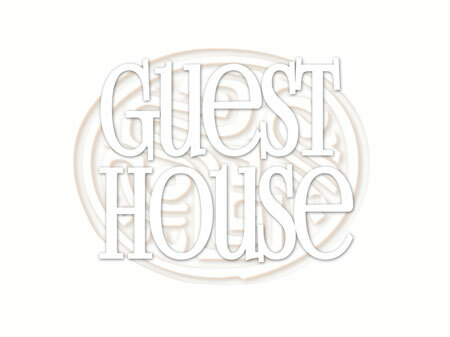 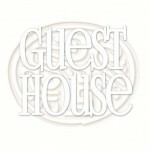 Guesthouse: 2 people. 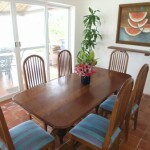 High Season and Holiday Season: Saturday to Saturday reservations only.